Manchester United midfielder Oliver Norwood has returned to Old Trafford after tearing a thigh muscle while on loan with Carlisle United. Norwood, 19, agreed a month-long extension at Brunton Park on Monday, but picked up the injury on Tuesday, ruling him out for around four weeks. "This is a blow for Olly because he has really enjoyed being with us," Carlisle boss Greg Abbott told the club website. "We think it has been a valuable experience for him." Abbott added: "Unfortunately this will obviously affect the loan spell that he would have had with us over this next month, but he is one that we will keep an eye on when he returns to action in the near-future." 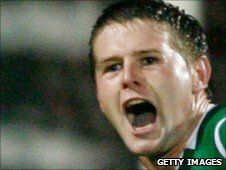 During his month-long stint with the League One side, Northern Ireland international Norwood made seven appearances, including five starts.